Enter my husband. He loves Brussels sprouts and has asked for them every now and then. He’s even tried making them a couple of times himself. I remember one of his experiments on the grill quickly turned into a molten mess. Now that we’re into the peak season for the best-tasting Brussels sprouts, I figured it was time to step up and try a recipe for him. But, I would definitely need to spice things up a bit. So I announced to my husband I was making Brussels sprouts with chorizo. He looked at me like I was crazy. Then he tasted it and gave me a big thumbs up! I figured if cabbage and hamburger go together, why not Brussels sprouts and chorizo? Brussels sprouts oiled, seasoned and ready for the oven. Roast only until the center stem is tender – it’s best to start checking as early as 10-15 minutes into the cooking time. While the Brussels sprouts were roasting in the oven, I browned the onions and chorizo. Slapped them together and voilà! I know lots of paleo people love Brussels sprouts. They’re a good source of Vitamins A & C, potassium, folate, iron, fiber and phytonutrients. 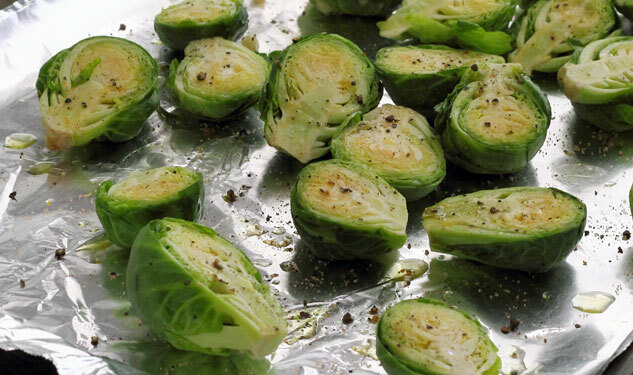 This Brussels sprouts paleo recipe would make a great side dish for just about any meal. You can also add more of your favorite veggies, mix it up with the spicy chorizo, and turn this dish into a main course. All of you Brussels sprout lovers will have to let me know what you think of this one. If you have a favorite recipe or tip for cooking them, let us know that too! Hi! I made one of your recipes for dinner tonight and it was a nice addition to my repertoire of regular meals. I’m bookmarking more for later. On this one, I don’t see why the chorizo couldn’t be cooked with the Brussels sprouts. A recipe I love to make is with chopped bacon and you put it on top of the sprouts raw. It needs a few stirs to cook all the bacon nice a crispy, but the flavour is all melded together and a drizzle of balsamic vinegar at the end adds a nice sweetness to it. I’ll try that with chorizo without the casing and see how it goes!